Professor Anne-Marie Grisogono is a complex systems scientist and Adjunct Professor in the College of Science and Engineering at Flinders University. 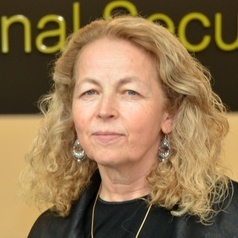 She holds a PhD in Mathematical Physics, and has worked in experimental and theoretical atomic and molecular physics, and lasers and nonlinear optics in various universities, followed by 20 years of applied R&D in the Defence Science and Technology Organisation (now DST Group), working on systems design, modelling and simulation, and future concept development and experimentation. Professor Grisogono was appointed to the Australian Research Council’s College of Experts in 2013. In 2015 she joined the faculty of SigmaCamp, a unique US maths and science summer camp for gifted students, organised by researchers from SUNY (Stony Brook), Brookhaven National Laboratory and Harvard Medical School, teaching a course on wicked problems. Her current research interests include fundamental questions of complexity science and improving the methodologies and tools that can be applied to dealing with complex problems. She holds a Bachelor of Science (Hons) and a PhD from the University of Adelaide.